In 2000, I moved to Victor Harbor, having spent 35+ years in motor mechanics and settled into semi-retirement. After adapting to the slower-paced lifestyle I took up a part-time position as Maintenance Engineer at a local not-for-profit organisation, and am still there. But I had too much spare time so started pondering about what to do for a hobby. RADIO! Being a music buff I approached then 5EFM, was welcomed in and within seconds of mentioning my music preferences as Classic Motown/Soul and British Invasion I was offered a regular spot as a presenter on Friday nights from July 5, 2013. That show became ‘Classic Soul’ and is still running. I also present Tuesday’s Arvo Show which is when you’ll hear ‘A’ and ‘B’ sides, album tracks and covers of the Baby Boomer era… Fabulous! After some turmoil at the station I began fixing this and that about the place and soon became responsible for maintenance, learning new skills relating to studio equipment and its installation and maintenance. 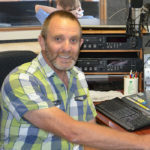 Now, in 2016 as a Member of the Board and after a complete overhaul of what has become Fleurieu FM, I’d like to think I’ve been a bit useful and with the Board’s permission would like to keep on doing my best. Encounter FM Broadcasters Association Inc.